In the lead up to Photokina 2012, Canon announced the new Canon EOS 6D full-frame entry-point model within days of Nikon publicizing their most-affordable full-frame camera to date, the 24-Mpix D600. While the EOS 6D boasted some attention grabbing features including built-in WiFi and GPS and slightly undercut the Nikon on price, it couldn’t match its rival in one or two key areas, namely the less populated AF system and lower resolution sensor. Sony is often quoted as having aspirations to rival Nikon and Canon but, since taking over the SLR business of Konica Minolta, has so far shown only a handful of pro-grade lenses. The SAL500F40G is one such lens, more popularly known as the 500mm f/4.0DG SSM, and with a price tag of $13,000 it’s aimed squarely at professionals and well-heeled enthusiasts. We’ve had the opportunity to assess the new lens at our lab in Seattle, please read on to see how the new Sony performs and if it has what it takes to compete with the current Canon and Nikon duopoly. With the vagaries of photographing wildlife, the flexibility of a telephoto zoom would appear to be an attractive solution. However, image quality is often a compromise at the maximum aperture and longest focal length, typically the most crucial settings. We’ve pulled some lens data from our database and put together a round up of popular zoom lenses over the years (and made some comparisons with high performance primes). Read on to find out which models have the best image quality. Launched in July 1999, the Canon EF300mm f/2.8L IS USM lens has been one of the most popular super telephoto lenses in the Canon range for wildlife and sports photographers alike. As expected for a super telephoto lens with a constant f/2.8 aperture and an Image Stabilizer, it is right at the top of the tree in terms of cost. But does the performance match the price? DxOMark presents the results, including a comparison of the Canon with the Pentax smc DA Star 300mm f/ 4 ED (IF) SDM, a lens also recently tested in our laboratories. 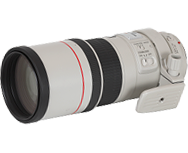 Telephoto lenses such as the Canon EF 300mm f/2.8L IS II USM are used for professional sports or wildlife photography. How does it stack up against an earlier Canon model? Let’s take a look.